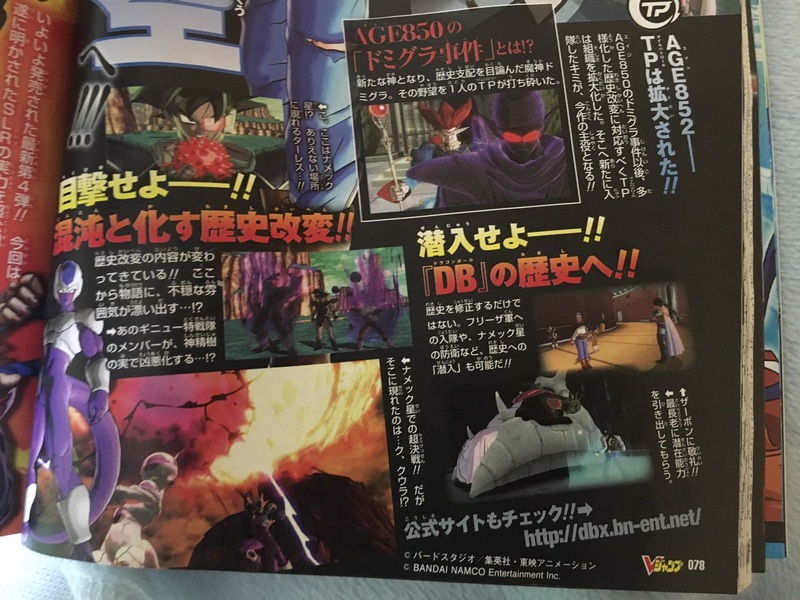 The events of Dragon Ball Xenoverse 2 occurring in Conton City take place. The Future Warrior is assigned a critical mission by Chronoa to stop changes in history created by the resurgent Time Breakers and their allies. The Future Warrior's mentor, Elder Kai oversees their missions from the Time Nest. Future Trunks and the Future Warrior, who had been summoned by Trunks' wish to Shenron and had previously defeated Demigra after his attack on Toki Toki City in Age 850, continue to search for Towa and Mira, assisting the new Future Warrior when they confront Turles and Lord Slug. After learning that Turles and Lord Slug have been recruited by the Time Breakers to cause time distortions throughout history, Chronoa announces that Tokitoki is about to lay an Egg which contains time for an entire universe. Xeno Trunks observes his mentor Future Gohan's death via the Time Scroll for Age 780 of Trunks' timeline and while talking to the Future Warrior, notices a time distortion has occurred in Age 780 As Xeno Trunks originates from that timeline, he leaves it up to the Future Warrior to fix the history change. However while observing the battle with Mira who had appeared after the Warrior and Future Gohan had defeated the reactivated Future Android 16, Trunks realizes that Mira is too powerful for them and not willing to stand by and watch his mentor and follow Patroller be killed, Trunks defies Chronoa and travels to Age 780 to join the fight against Mira. After Mira retreats Chronoa witnesses Trunks: Xeno reunion with Gohan. When Xeno Trunks reveals his intentions to assist Gohan in battling the Androids, Chronoa tries to convince him to reconsider and orders the Future Warrior to stop him when he fails to listen. However Gohan and the Warrior manage to convince Xeno Trunks let Gohan face 17 and 18 alone as he did in the original history. Chronoa allows Future Gohan's encounter with Xeno Trunks and the Future Warrior to remain in the timeline as Gohan ended up being killed as he had in the original history and out of consideration for Trunks. Following the defeats of Cell in Age 767, Future Android 16, and Future Cell in Age 785 by the Future Warrior, Chronoa announces that Tokitoki has finally laid its egg. Xeno Trunks and the Future Warrior notice a history change in Age 774. After the Future Warrior defeats Supervillain Broly in Age 774 preventing him from interfering in Majin Vegeta battle with Goku and Majin Buu, Xeno Trunks observes his father's saying good-bye to his main timeline counterpart before his father's sacrificial Final Explosion and afterwards reveals to Elder Kai and Chronoa that he is proud to be his father's son. After the fight with Supervillain Janemba in Hell, the Future Warrior brings back an injured Xeno Trunks who had been defeated by Janemba. After the Future Warrior assists Goku and Vegeta, in defeating Supervillain Kid Buu, Xeno Trunks awakens after recovering from his injuries and informs them that there was Masked fighter assisting Janemba and that they may be watching nearby. The Future Warrior finds the Masked Saiyan and ends up chasing them to Age 778. When the Masked Saiyan and Future Warrior end up in Age 778 during Beerus' battle with Goku, Chronoa attempts to pacify Beerus by sending some Pudding she made, however Beerus is enraged at its horrible taste and Goku is incapacitated by stomach cramps after eating some, however Whis and the Warrior manage to calm Beerus. Beerus and Whis travel to the Time Nest after being tricked by Towa who had hacked into the Time Nest's communications and imitated Chronoa in order to lure him and Whis from assisting Goku and his friends during the altered timeline of Frieza's revenge in Age 779. Angered over Towa's blasphemous actions, Beerus and Whis assist the Time Patrol in undoing the damage caused by their absence, allowing the Future Warrior to prevent Frieza from destroying the Earth and successfully killing Goku. Beerus is enraged when Towa fails to appear after correcting the history change in Age 779. At first, Whis suggests he seal Elder Kai in the Z Sword again to alleviate his stress, but then offers to spar with Beerus and the Future Warrior after learning about Tokitoki's recently laid egg from Chronoa. Beerus however is forced to leave during the sparring match when Whis draws his symbol on the God of Destruction's forehead with permanent ink. The Future Warrior manages to defeat Whis in the sparring match. Beerus decides to leave Towa's defeat up to the Future Warrior and the Time Patrol, and returns with Whis to his planet in Age 779. Xeno Trunks, Chronoa, Elder Kai, and the Future Warrior decide to focus on finding the Masked Saiyan whom they had discovered was Bardock after his mask broke during his fight with the Future Warrior in Age 778. As a result of their investigation, the Time Patrol discovers the Time Breakers had taken control of Earth in Age ??? and that Towa had manage to capture and brainwash Ace, turning them into the Masked Future Warrior. Xeno Trunks and the Future Warrior return from Age ??? with the Mask Ace wore while brainwashed, after Towa retreats following Mira's imprisonment in the Time Rift by Bardock and Ace being freed from her control. However the presence of the mask Towa used to brainwash Ace in Age ?? ?, causes Future Trunks to remember his partner and discover the source of the time distortion inside the Time Scroll for Age 850, allowing the Future Warrior to travel back in time to stop Towa from killing Shenron. Despite her defeat in Age 850, Towa suddenly appears inside the Time Vault and attacks Chronoa. It is revealed that Towa bypassed the barrier around the Time Nest via the Ace's Mask which Xeno Trunk had brought back with him from Age ???. Towa reveals she infiltrated the Time Nest in order to steal Tokitoki's Egg and states that she will use its power to revive the Demon Realm. Towa uses the Egg's power to open a portal to the Time Rift, freeing the trapped Mira who attacks Xeno Trunks with an energy blast. He tries to do the same to the Future Warrior, but Ace takes the blast for them, as Towa and Mira flee to Age ???. Injured by Mira's attack, Ace leaves the Time Breaker's defeat up to the Future Warrior. Xeno Trunks recovers and from the Time Nest informs the Future Warrior that the Time Patrol will be unable to assist them in the fight against Mira. He and Elder Kai witness Mira defy Towa and as his encounter with Bardock inside the rift had changed him and observe Towa join forces with the Warrior to prevent Mira from overheating and destroying the universe after removing his power limiter. They then observe Super Saiyan Blue Goku use the Dragon Fist to remove Tokitoki's Egg from Mira, allowing the Future Warrior to finish off Mira with a Super Kamehameha. After Mira's defeat, Goku and the Future Warrior travel to the Time Nest, where Chronoa stops Goku when he tries to eat Tokitoki's Egg, before informing everyone that the Egg is ready to hatch and they are about to witness the birth of a new Universe. In recognition for their defeat of Mira, the Future Warrior becomes known as the Conton City Hero and receives a holographic statue in Conton City's Recreation Plaza. As Whis prepares to return with Goku, Goku informs him that the Time Patrol is planning to have a feast to celebrate the return of Tokitoki's Egg and the defeat of the Time Breakers, causing him, Goku, and Beerus to remain in Conton City for the feast. Elder Kai ends up bumping into Beerus and he ends up angering Beerus with his attitude towards the God of Destruction due to his grudge over being sealed in the Z Sword, causing Beerus to almost destroy Elder Kai, but Whis arrives in time to defuse the situation with a plate of food. Chronoa summons Shenron at the behest of Tokitoki to wish up the promised feast and manages to dissuade her from cooking the meal herself. Elder Kai objects to using the Dragon Balls to order takeout as he puts it, but Beerus states it should be alright as it is a special occasion, so Chronoa wishes for a feast that will leave everyone full and satisfied. Members of the Time Patrol's Hero Society appear in Conton City to give the Warrior gifts in honor of their achievement. The Future Warrior investigates the Five Time Rift anomalies that had appeared in Conton City and discovers that they were created by 5 Distorted Time Eggs. After collecting all five, Chronoa reveals they were created by Towa in an attempt to replicate Tokitoki's Egg, but failed and decided to plant them in various places and eras resulting in the creation of the five anomalies. As the anomalies are stable, Chronoa decides to allow them to remain. Chronoa and Elder Kai ask the Future Warrior to look at the Time Scroll depicting Bardock's battle with Mira inside the Time Rift that Bardock had pulled Mira into after being freed from the Time Breaker's mind control. Chronoa asks the Future Warrior's opinion on what happened to Bardock following the battle. Chronoa and Elder Kai show the Future Warrior a Time Scroll that shows an altered timeline where Xeno Trunks decided to go through with defying Chronoa and saving the life of his master Future Gohan, resulting in Future 17 & 18 being destroyed by Future Gohan and Xeno Trunks in Age 780 and creating a new future timeline where Gohan never died. Chronoa asks the Future Warrior their feelings on where the change should be fixed or not, but reminds them she has final say regardless, but takes their feelings under consideration. It is unclear if she decided to fix the change or allowed it to remain as an alternate timeline where Xeno Trunks lives in peace with his mentor, Future Bulma, and his younger counterpart. Chronoa later reveals that Xeno Trunks' actions where caused by a natural time distortion produced by the distorted time eggs in response to Xeno Trunks' strong desire to save his master. Frieza leads the Frieza Force from the Frieza's Spaceship Time Rift anomaly through a Wormhole to invade Conton City resulting in a conflict between it and the Time Patrol. The Future Warrior and several other Time Patrollers manage to stop the Frieza Force from taking over Conton City.